SKOHRboard: 2011 College Football Playoffs the "TKS Playoffs"
2011 College Football Playoffs the "TKS Playoffs"
Presenting the TKS Playoffs. This is the officially recognized SKOHRboard College Football Playoff system and it just so happens to be designed by and named for yours truly. It's revolutionary in fairness, quality, maintaining bowl tie-ins, and it keeps all the playoff games within the calendar dates of the current bowl schedule. It's quite simple too. It's a 12 team system that gives the top four seeds a first round bye. The TKS takes the conference winners of the top eight conferences, according to the season ending Sagarin Conference rankings, along with the remaining top four teams, according to the season ending BCS rankings, receiving At Large bids. Note there is a maximum of two schools per conference, which means that Boise St. makes the cut this year rather than Arkansas. Those 12 teams are then ranked 1-12 according to the current BCS rankings, with the first four teams receiving first round byes. The teams are then matched up in the pairs 8v9, 5v12, 7v9, and 6v10 for the first round games which will be played Saturday December 17th at the home field of the higher ranked teams. 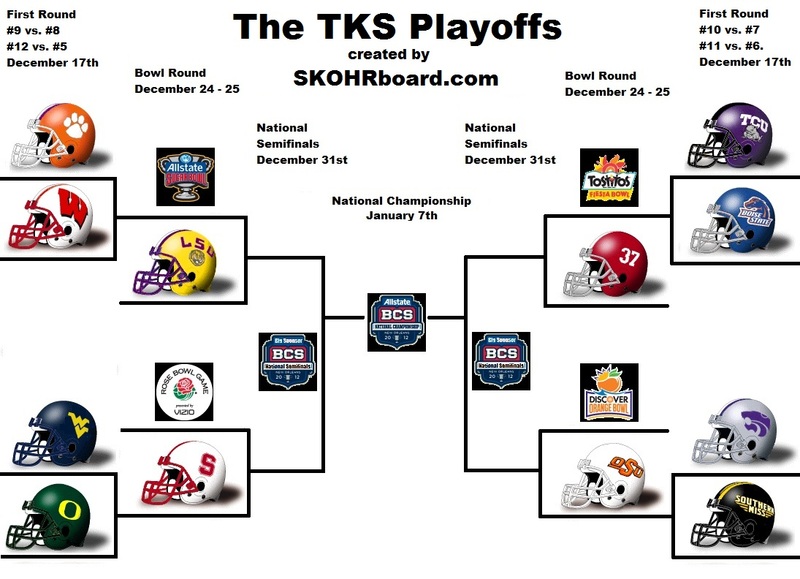 The second round is going to be the BCS Bowl game weekend. The Bowls will get to choose their matchups the way they currently do with a rotational system of first through fourth choice. THEN! And this is my favorite part of the TKS Playoffs. The newly created "Insert Big Sponsor" BCS Semifinals! The BCS Championship game will be played as it normally is but we'll do it on Saturday January 7th because everyone hates the National Championship game being played on a Monday night. So there you have it. The most awesome College Football Postseason ever created. All I ask is for a 50% cut of the naming rights to the Semifinal games, that seems fair. I like it, it makes sense and has the financial and time constraints taken into account! Nice job SKOHRBOARD.